Everyone wants to know: Is KIRO's show Too Beautiful to Live? 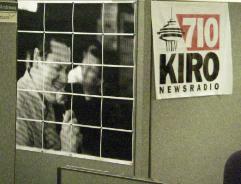 Seems the KIRO suits were high-fiving each other Monday: "We're the highest rated show on the station in the 18-34 demo," says Luke Burbank, the host of the new low-concept show (m-f, 7-10p). This seems like a fine distinction, he says, "except that when we took over the slot, it was at 0.00. And the whole idea behind TBTL was to get the youngsters." Well, although they haven't yet seen their numbers separated out from the Phil Hendrie Show (the initial book lumps the shows together), it looks like they're doing just that.